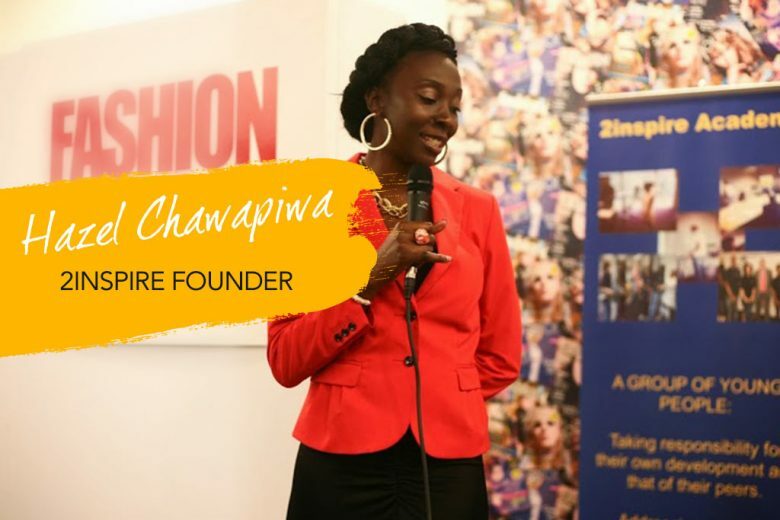 Serial entrepreneur, single mum and all-round inspiring woman Hazel Chawapiwa explains what motivated her to start the 2inspire Network and Academy, and why she doesn’t believe in competition. I was always quite an ambitious young lady, who had dreams of graduating from university and having a high flying career. This plan was disrupted when I had to drop out of university to have a baby. However, I was determined not to let this stop me, and once I felt settled and had found a nursery place for my son I returned. This was a really tough time, I had to juggle a job due to mounting child care costs, studying full time and looking after a young child. It was the financial strains I felt at this period that was the driving force for me to start my first business in 1999. I was also driven by wanting to be able to provide the best for my child and knew I had to work hard to do this. I graduated from university with a BA in Business Studies that same year and went on to work for two FTSE 100 companies. It was in these roles that I learnt about the dynamics of working for multi-national corporations, which were great teaching environments in all areas of business. A redundancy and the need to raise a deposit to get on the property ladder led to me becoming involved in a number of business ventures – one of which was an events company which I started with a long-time friend. It was a successful venture and it was during this period that I realised that working full-time was suppressing my entrepreneurial spirit. I continued with the events company, which allowed me to leave the hustle and bustle of the city and went on to work in the more flexible environment of local authorities. And it is here that I found my love for working with organisations that benefitted the local community, particularly those which enhanced the life skills of young people. Becoming a mother again in 2007 led to change and a break from business and work (although between 2007 and 2009 I became a partner in a real-estate investment business and a hair company, however, due to personal circumstances I was unable to fully focus and contribute effectively and so pulled out of both businesses). I returned to full-time work in 2009 but always felt that I missed the buzz of the business world. The pivotal turning point in my business career was when I became pregnant with my third child. During my maternity leave in 2011, I found myself in a place where I had to literally start from scratch all over again. I had separated from my partner and had to move into my mother’s house with my three children, however with the support of family and friends I found a new determination and focus that was missing before and went on to rebrand and re-launch the hair company hair2inspire. This was a good time for the company – sales increased significantly and I managed to hire an assistant to help me. However, although it was a profitable business, I was not passionate about it and so often got complacent in my everyday business operations. So once my daughter was 10 months old, I returned to work part-time job as a Business Manager in a Children’s Centre. Due to the flexibility of the role I could still manage my hair business, but I still didn’t feel satisfied. I knew I wanted to do something else. What prompted you to start the 2inspire Network/2inspire Academy? In May 2012, things were going exceptionally well for my hair business. I felt so grateful and fortunate as I knew that it was mainly due to the network of women around me who had helped me to get back on my feet. I felt inspired to develop an organisation that would support and empower women, particularly those who want to start a business or are already in business. And so the 2inspire Network was born. I found that a lot of women are inquisitive about starting their own business but are scared to take that leap, I wanted to show other women that business is a possibility for anyone, it is all down to your mindset, self-belief and hard work. I really wanted to do it because not everyone is fortunate enough to have good people in their lives to guide or support them on their life journey. Everyone could run life’s race on their own but the race would be so much more fulfilling and faster if we had someone to point out the shortcuts and to encourage us to keep running when we are exhausted or about to give up. In March 2013 I went on to launch an organisation for young people titled 2inspire Academy. My teenage eldest son and a few of his friends were the inspiration behind it, as I saw a need to motivate them and keep them engaged, particularly during the summer holidays. It was at a time when it dawned on me that as a parent I cannot create my son’s personality but I can affect his values, his education and what new skills he is exposed to. Inviting my son to be one of the members of the steering group of the academy was one of the ways I tried to address this. It was also my way of trying to help him realise that he is blessed with beautiful strengths and also to provide him with an opportunity to express these strengths in the service of something greater than himself. What’s the aim of the 2inspire Network and who is it for? It’s an organisation that is dedicated to providing positive platforms, events, social media platforms and training that empower and inspire women particularly in business. One key objective of the business is to support women in enterprise and to assist them to enhance their socio-economic outcomes. The aim is to assist entrepreneurs to find innovative ways to promote their business and provide forums and events that allow women to network, develop collaborative working relationships and inspire others. How practically do you help women? We provide opportunities that allow women to connect, support, empower and inspire each other. For example, via our social media platforms such as twitter, facebook and our blog we promote businesses run by women, we also have a series of interviews on our YouTube channel. In addition to this we run an event entitled Ladies day which provides a physical platform to help entrepreneurs to promote their businesses and is a great opportunity for women to connect with likeminded women and to be empowered by the various workshops and amazing women that are present at the event. I think that these have been very practical methods of helping women as they not only promote a positive image of women who are dynamic role models in the UK, but they also inspire others to go for what they want. I find that in the UK we all get caught up in the rat race, and somehow instead of supporting our fellow sisters we believe that we are in competition with each other, which I don’t agree with. I believe that there is no ultimate winner in life, we are not all competing for the same top spot. Personally I like to see it as we are all running our own race against ourselves, to get to our own destination. I remember hearing a talk years ago when the speaker said, “We can’t all possibly be after the same pot of gold, there is a pot for every one of us, but we have to help each other to get to it.” I truly believe this! One of my favourite quotes is, “ Alone we can do so little. Together we can do so much” by Helen Keller. Where would you like to see 2inspire in five years? I am very passionate about empowering individuals and helping them to reach their potential, so my team and I will be looking for opportunities and partnerships that will allow us to develop this line of work. The academy is currently working with a few organisations to develop our youth programme and we intend to look for partnerships that will enhance our network’s service to women in business. Establishing a members programme and developing a training and development programme is definitely in the pipeline as well as making Ladies Day a larger scale event. You’re a single mum. How do you balance your work and family? This can be very challenging, especially as all of my children are at very different stages in their lives and so their needs both mentally and physically are very diverse. I make a point of factoring individual days out with each of them into my schedule once a month and endeavour to have little family breaks, usually during school holidays, when we just focus on having fun! I really have had to change my work pattern and have got people on board to assist with the businesses so that I am able to create a routine that encapsulates all the things that are important in my life. The business world is very fast paced and can be overwhelming at times but making sure I spend quality time with my family is really important, gratifying and a great stress relief. What’s your support network like? Who do you rely on for help? I am very fortunate that I am surrounded by a multitude of extraordinary women who have supported me and have helped me to find my feet during really hard times, particularly my mum and my sisters. Although I have definitely bounced back and am continuing to get stronger they are still there for me and have been very supportive. Also I have met an amazing array of women over the years who have been instrumental in the success of the 2inspire businesses and have helped me to develop in so many different areas. Most definitely my mother. She to me is prime example of a strong, selfless women who has a powerful influence on those around them. She has a lovely way with people that I admire in awe and is a very determined and hardworking woman and a great mother and grandmother. Have a long term plan, but understand that it is more than likely going to get tweaked along the way. New ideas, opportunities and even setbacks will mean that your plans will change as you go along, but embrace the change, stay focused and don’t give up! There is risk involved in running a business and sometimes things you try will fail, but this shouldn’t deter you – you should see it as a lesson learnt. Also network as much as you can and ask questions, there are people out there who can help you and make your journey easier. Business isn’t easy and it can take years before you start to reap any real financial rewards which is why I always advise people to set up a business in something that they enjoy doing and are passionate about. It shouldn’t just simply be about money, as your productivity is so much higher when you enjoy what you are doing. Passion is a vital ingredient to happiness, not the only ingredient might I add, but a very important one that makes our life colourful and enthralling. Passion goes beyond the realms of wants and desires, it is the thing that keeps us moving whenever life tries to knock us down or the thing that puts that spring in our step. Aside from that, continue to increase your knowledge, and read material that is uplifting, educational and motivational. I have found investing in my mind has helped me to become more positive, confident and relaxed. You can find out more about Hazel and the 2inspire Network on their website. You can also follow them on Twitter and Facebook.